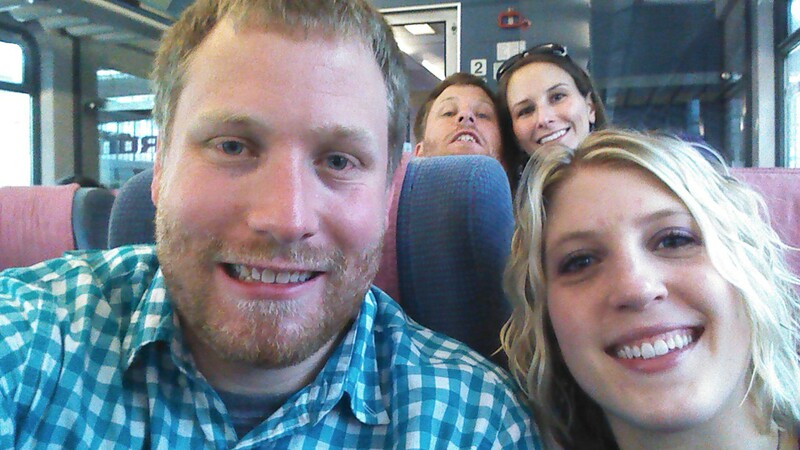 On May 28th we left Munich and headed to Salzburg. We packed up our stuff and any food we had bought at the grocery that we could take along. We didn't bring this because there wasn't much left but I thought it would be fun to show you a Honey Nut Cheerios box from Germany. Looks so similar! I had another interesting conversation with the apartment owner. Were about to head out that morning and I called her using the phone in the apartment to tell her we were leaving and would just leave the keys on the table. Here's how that went. Me: Yes we had a wonderful time, thanks. Can we just leave the keys on the table? Luckily I didn't have to try to interpret what the heck she meant by "Yes ice-cream shop" since there was an ice-cream shop at the bottom of the apartment building I interpreted it to me "No, do not leave the keys on the table. Take them to the ice-cream shop." We didn't hear from her again so I'm thinking I guessed correctly. We headed over to the subway and took it to a stop where we walked a block to the train station. We think in retrospect there must be a way to get into the train station from the subway but we found it regardless (after asking one person) and it was actually nice and sunny out so walking outside for a few minutes was welcomed. 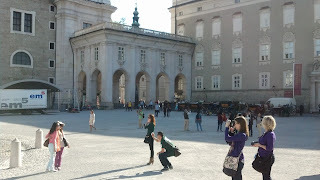 Once we arrived in Salzburg, we hopped on the #6 bus to take us to where the apartment was. It was about a 20 minute ride or so. I had received instructions from the owner of how to use public transportation to get to the apartment using the bus system since Salzburg doesn't have a subway. From the bus stop it was about a 7 minute walk to the apartment which was in a residential area. We were greeted by a friend of the owner since he was not able to meet us. He showed us everything in the apartment, explained a little bit more about the buses, etc. His English was wonderful. This apartment had 3 bedrooms (all upstairs), 1.5 bathrooms (full up and half down) and a kitchen (including washer) and living room area downstairs. In Europe we have found that most washers and dryers are in the kitchen or a bathroom and do not have their own room like our laundry rooms. We didn't hang around for too long because it was going on 1pm and we were starving. We left and hopped on the bus to the center city area to grab lunch at Fisch Krieg Restaurant recommended by the Rick Steves book as a great place to grab a fish sandwich or salad for lunch. Well once we finally found it (it is seriously tucked away with no good signs) we left immediately as the food looked worse than a Long John Silvers. At this point I was super hangry and I think everyone else was too. We went to the nearby Billa grocery store to get premade sandwiches, salad, fruit and trail mix. Definitely not a stellar lunch but we were ready to eat and get on with our day. In all our searching around for the restaurant we had seen a good bit of the city center. We then headed back across the river to tour Mozart's house, something Megan really wanted to do as she was big into piano. Mozart and music in general is a big part of Salzburg so I thought it would be really cool to see his house, right? WRONG. It was a nice house but the whole self audio guide tour was about the authenticity of paintings of Mozart. At first this was okay but 45 minutes of just hearing about that... no bueno. There were a few little tidbits about him growing up and we did get to see some of original instruments but I thought that's what the whole tour would be about which would have been waaaay more interesting IMHO. I could tell the boys were bored but I couldn't tell if this is what Megan had in mind and I was a little afraid to say how terrible it was. Then she expressed that this wasn't what she thought it would be and we high-tailed it outta there. She apologized for wasting an hour of our lives but really who knew? The Rick Steves book certainly didn't explain it well. Here is a model of the house that was in the lobby area. There weren't any photos allowed inside but that really wasn't a big loss based on what the tour was. We spent some time enjoying the sunshine in a little grassy area outside of Mozart's house and planning the rest of the day. We crossed back over the river on the bridge of locks. 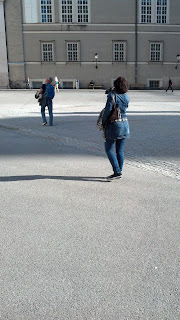 And leisurely walked around Mozartplatz and Residenzplatz taking photos. 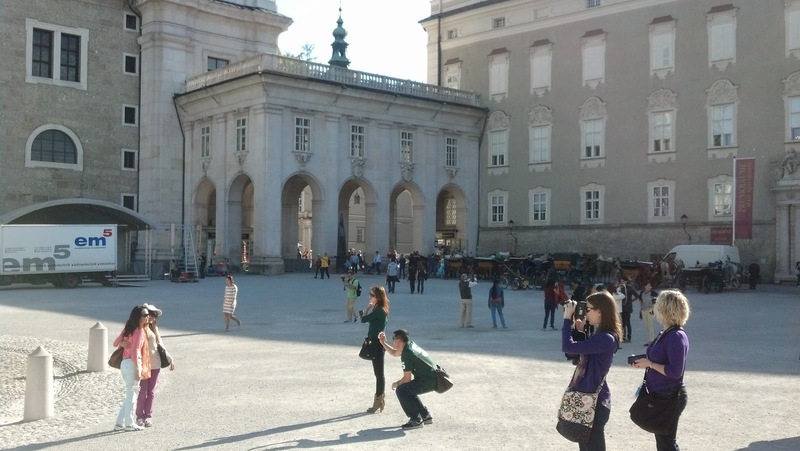 There were some big statues and the Salzburg Museum. 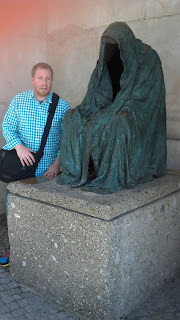 And a slightly scary hooded figure. We also spotted Denim Danielle (as we named her). Who even know that many denim items in one outfit was possible... denim jeans, denim skirt and denim top. All the same shade of denim I might add. We could tell she was a tourist but aren't sure from where. There were people playing chess on this life sized board too. Next we decided to head up to Hohensalzburg Castle which literally means High Salzburg Fortress. And no that is not a man standing on top of that giant ball sculpture are we the only ones that make that mistake, it's a statue. This is what I was most looking forward to about that day. You can see it atop the mountain from most anywhere in the city center (you may have noticed it in my photos where we crossed the river from Mozart's house. You can take a trolley ride up to the top for several Euro but being young and in shape we decide to walk up. This was the steepest climb I've ever done and had lots of uneven pavement/stones to watch out for. It was no joke. I'd rather do one of my Insanity Cardio workouts than climb that again. This photo looking behind us at one of the curves in the climb doesn't even do it justice. But the reward was wonderful! The views were breathtaking. And it was getting close to when the sun was setting and it was just gorgeous! Rick Steves won our trust again with this worthwhile activity while not wasting time inside the fortress. It is several Euro per person but don't have to pay the full price that those touring the castle pay. We stayed up here awhile taking in the views and putting off the walk back down. I love the mountains in the distance. We had purposely planned to go to a restaurant near the castle for dinner. After our walk back down and asking a souvenir shop owner where a certain street was, we found it. 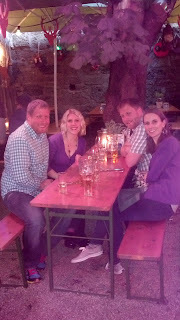 St. Paul's Stub'n Beer Garden was tucked away almost under the castle and was filled with locals. They had nice outdoor seating. We got the waitress to take a photo of us and it's a little hazy but you can still see the nice setting. The boys ordered beer and the girls ordered wine. I know it is a beer garden but we just aren't beer-liking girls. We were hungry after our hodge podge of lunch so we ordered an appetizer of different cheese spreads, pickles and such. It was delicious. Megan and I split a salad and an order of Cheese Spaetzle, a traditional Austrian dish. We thought it would be more like macaroni and cheese when we heard it was cheese and pasta and while it wasn't bad, it was way more greasy cheese than pasta for my liking so I don't think I would order it again but I've heard some people really love it. The salad dressing on the salad was very light and good though. I would come back to Paul's for the great atmosphere and just order something different. After dinner we grabbed the bus back to our stop, where a grocery store is right across the street. We had planned to pick up a few things for breakfast but you can imagine our surprise when we found it had closed at 7pm! And it was not opening until 8am. It really made me appreciate how we have grocery stores and other places open late and sometimes even 24 hours. We walked back to the apartment to rest up for our big day the next day.